Choose Your Ideal Freezer Size. Be Goldilocks. Be Goldilocks: Choose Your Ideal Freezer Size. Before you buy a new freezer figure out the ideal freezer size to meet your families needs. First you have to consider your family size, by which I mean the number of people who eat at your house daily. Next think about what you want to use your freezer for. Do you need extra freezer space for bulk purchases or seasonal harvests? Your family size is the biggest factor in picking the ideal freezer size. A family of two doesn't need nearly as much space as a family of ten, even if the family of ten isn't freezing homemade meals and the family of two is. Remember that you use your freezer for a supply of ice, frozen fruits, veggies and meats. 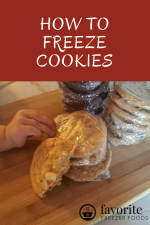 You might freeze bread or other baked goods and who doesn't have ice cream in the summertime? What Do You Want to Use Your Freezer For? Depending upon what you want to do with your freezer you might want to get a larger size freezer. Do you garden and want to freeze some produce to store for the off season without canning or drying? Do you hunt for meat? Are you thinking of ordering a side or whole pig, cow or sheep from your local butcher? Does your family eat a lot of frozen meals, store bought or homemade? Do you like to shop in bulk and stock up? These are great reasons to get a larger freezer. You might also consider a second freezer so that when your seasonal stock gets low you can unplug the extra freezer to save on electricity. A cubic foot of freezer space holds about 35 pounds of food. Packaging also takes up space. And not everything will fit perfectly together leaving dead space in your freezer. So in reality it's more like 30 pounds per cubic foot. The rule of thumb to plan for is 1.5 cubic feet of freezer space per person in your family. Thus a family of 4 should get at least an 6 cubic foot freezer. Choose a freezer that's not too big and not too small but just right. For the best energy efficiency your freezer should always be 2/3s full or more. 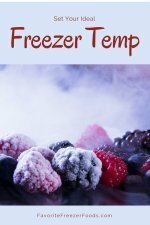 You’ll turn over your freezers contents 3-4 times per year, maybe more if you use foods from your freezer everyday. If you're still not sure what your ideal freezer size is, however, I recommend estimating on the high size. You can freeze water in solid containers to keep the freezer full and the energy cost down. The Johnson's are married with two young kids. Mrs. Johnson likes to stock up on store specials. Mr. Johnson has a veggie garden. They need at least 6 cubic foot of freezer space for their family of four and with the store sales and homegrown produce might want to get a 10 cubic foot freezer. The Smith family has three kids and Mr. Smiths parents live with them too, plus the kids friends often eat over. Mr. Smith likes to hunt and his mom can't resist a good bargain. With 7 people in the house and regular guests at the dinner table they need at least a 10.5 cubic foot freezer. With the hunting and bargain shopping they might want a second 10.5 cubic foot freezer for seasonal use. The Jones's have two teenagers who will be leaving for college in the next few years. They don't stock up a lot, don't hunt or garden and are thinking of trying a raw diet when the carnivorous teens leave the nest. Instead of the 6 cubic feet an average family of four might want the Jones's could get buy with a 3.6 cubic foot freezer. Return from Ideal Freezer Size to the homepage of Favorite Freezer Foods.